Phnom Penh (FN), Jan. 21 – Cambodia National Rescue Party of the United States of America (CNRP-USA), a clique of former CNRP president Kem Sokha, issued a statement declaring that all the decisions made by Sam Rainsy are incompetent and that the decisions did not represent the dissolved-CNRP. 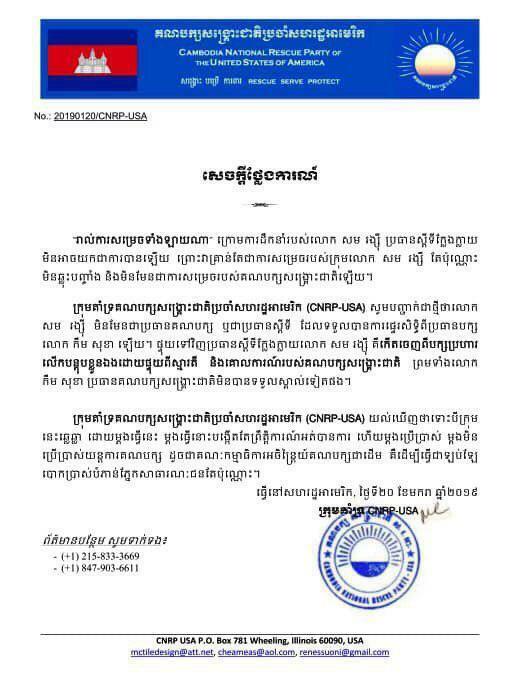 The statement came after former Vice President of CNRP Mu Sochua and Eng Chhai Eang held a conference to announce the result of the Permanent Committee meeting of the now-dissolved CNRP, which took place in Lowell, Massachusetts, USA, chaired by Sam Rainsy. At the press conference, Ou Chanrith, a former CNRP leader, confirmed that the Permanent Committee of the former CNRP supported the appointment of Sam Rainsy as the Acting President of the Former CNRP at the Atlanta Conference in December even without hearing from Kem Sokha. It is worth nothing that tensions between Kem Sokha’s groups and those of Sam Rainsy arose after the appointment of Sam Rainsy as the Acting President. Former CNRP leader Kem Sokha considered Rainsy’s appointment “party revolution”.